Waterpebble is an innocuous and trendy Eco-gadget designed to help raise awareness regarding how much water is being used while in the shower, and to help decrease that amount so gradually that it's practically undetectable. The goal is to make saving water fun and easy while bringing its importance to the forefront. Paul Priestman is the innovative mind behind Waterpebble and was originally inspired by a hotel bathroom sign that read, "Please Use Water Sparingly." 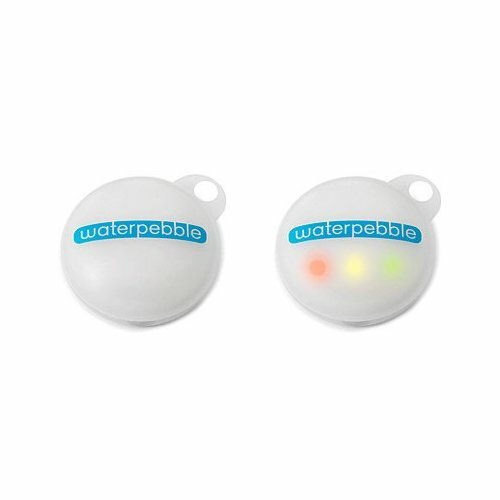 The Waterpebble is a small round device that has three light indications of red, orange and green. They indicate, respectively, "too much," "just enough" and "Well done-you're saving the planet." Simply place Waterpebble in the bottom of the shower and it records the length of your showers. From that point on it starts gradually encouraging you to diminish your shower time by flashing the appropriate light. During your next shower it will flash green, orange or red. If you have let it go all the way to red, then you have exceeded the amount of time of your last shower. If you stop showering at green you have beat your record. The idea is to keep each shower at six minutes or less. Families who use Waterpebble can look forward to their future water bills. It is a clever and environmentally conscious way to make the process of saving water a more instinctive trait. The Waterpebble has already been positively reviewed by such publications as The Week, The Daily Telegraph, BBC and the Observer. Waterpebble is not only encouraging people to use less water, it is helping people to become educated about conservation. Families report that their kids love the idea of playing a role in protecting the planet and hop out of the shower without being constantly reminded. Unlike some Eco-conscious gadgets that simply shut off the water when you have reached your limit, Waterpebble is being praised as a constructive device that allows people to ease in to water conservation in a way that is enjoyable and educational. For more information, please visit Waterpebble online.